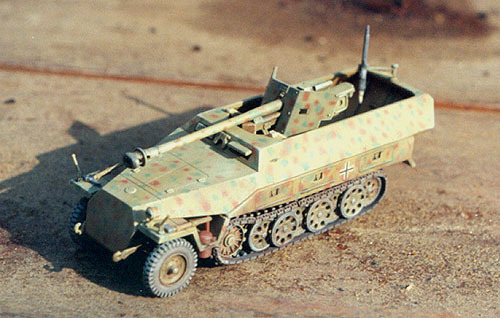 I was very excited when Hasegawa began releasing their series of Sd.Kfz. 251 Ausf. D kits. These were very important vehicles during the war, and until now, the only one available in 1/72nd scale was by Al.By. Although a fantastic kit itself, it is both expensive and hard to find. Not so with the new Hasegawa kits. They are all very reasonably priced, and also quite common. I have measured the kit against the dimensions and plans included in the Wydawnictwo Militaria and the Osprey New Vanguard books, and according to those two references, this kit is exactly 1/72nd scale. The overall level of detail on the model is very good. In particular, the drivers compartment comes complete with a detailed dash board, radio, gear shift levers, steering wheel, and even the pattern of springs on the back of the driver's seat. The wheels are exceptionally well-detailed, the undercarriage is very crisply molded, and the MG-42's are also very nice (although the stocks are a little thick - I sanded mine down some to make it thinner). 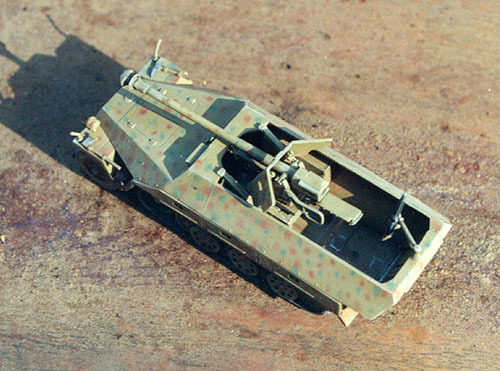 The cannon is better than the ESCI PAK 40, although the inside surface of the shield is bare, where there should be numerous details. The main deficiency I see is that the recoil slide (I'm not sure the correct name for this) is molded solid, where it should have a hollow groove down its center. The interior of the fighting compartment includes many details, including the mounting support for the cannon, ammunition box, crew bench (with open storage compartment behind the bench), fire extinguisher, and a detailed floor. The inside of the rear door has the latches molded on. The driver's armored visor can be open or closed. The kit instructions are up to the usual Hasegawa high standards, and include an excellent painting and marking guide. The rear fighting compartment doors are molded as a single piece, and need to be cut apart if you wish to have them open. They are also not large enough to completely fill the rear opening, so there is a gap either above or beneath the doors. I tried to center mine to minimize the gap on either side. The fit of many of the hull components can be tricky, so remember to constantly dry-fit as you go along. There are no figures or stowage items included. The decals, although printed in register, are too thick. Even after several layers of dullcoat, there is a noticeable edge around the carrier film, an edge that catches the chalk dust I used for weathering. Although the interior has a fair amount of detail, I have heard complaints from others that it is still missing substantial amounts of detail. I don't know what is missing, since I was unable to locate any interior photos of this particular version of the half-track. I haven't made up my mind about the tracks. They are molded in soft vinyl, and the interior surfaces are not well detailed. However, the exterior surfaces are very well detailed. They were very easy to attach to the kit. Hasegawa attached the wheels to a separate part with the axle detail, which is then glued to the hull. This works very well, and allows for easy gluing and painting of the wheels and tracks. Usually, I prefer hard plastic tracks because it's easier to glue them, and the paint stays affixed to them after many years. I glued these tracks together with Tenax-7R, which worked very well, and so far the paint has adhered well. Time will tell if they remain that way. I had to glue the track to the tops of the wheels with superglue. I placed heavy objects on the tops of the tracks as the glue dried. Again, time will tell if the glue will hold. I am not sure if this is a common problem, but in my kit the left track was slightly longer than the right, and was a little too long to fit snugly around the rear idler wheel. Was one of my track pieces stretched? Or were the wheels on the left side slightly closer to one another? The axe on the left fender was a separate part, but the pick-axe on the right fender had the axe head molded to the fender piece, while the handle was a separate part. Unusual. In all, I am very pleased with this kit. It was quite simple to build, it's very accurate, and the final result looks very good. It's important to note that this 251/22 kit is identical to the 251/1 kit, but with an additional sprue of parts for the PAK 40. So, if you are looking for only a 251/1 kit, you might be better off buying this one, and keeping the PAK 40 for other conversion projects. References: SdKfz 251, Wydawnictwo Militaria No. 12, by Janusz Ledwoch; and SdKfz 251 Half-Track, 1939-1945, Osprey New Vanguard No. 25, by Bruce Culver and Jim Laurier.